Could plant diversity become free (as in speech)? I’ve been tremendously privileged to be at the Seed Savers Exchange 33rd Annual Campout and Conference in Decorah, Iowa. It’s a wonderful gathering of people interested in saving and sharing seeds, with all sorts of workshops, practical classes, and speakers. 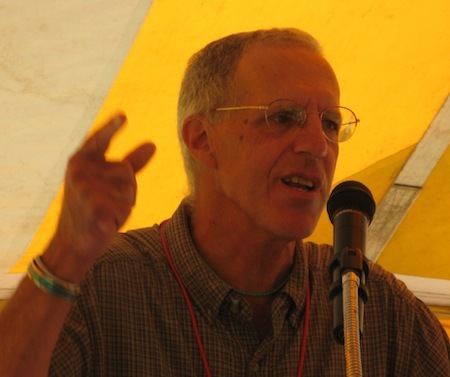 One of this year’s speakers was Jack Kloppenburg, of the University of Wisconsin. Kloppenburg wrote First the Seed (now available in a second edition), which is the best analysis of the economic nexus that surrounds seeds and plant breeding. He told the audience he was “here to share an idea, just like you guys share seeds.” So I’m sharing his idea: the Open Source Seed Initiative. Kloppenburg set out his ideas in a 2010 paper in the Journal of Agrarian Change. In it, he rejects what he calls the “accomodationist” approach to patents and other efforts to restrict access to plant genetic resources. Accomodationists, he says, seek “market mechanisms for compensating those from whom germplasm is being collected”. Instead, he proposes a more radical approach derived directly from the open source software movement. The Open Source Seed Initiative prevents the privatisation of plant genetic resources and, in Kloppenburg’s view, also “might actually facilitate the repossession of ‘seed sovereignty’”. Open source software is accompanied by a licence that encourages people to share it and create new programs with it, and at the same time prevents anyone from releasing a program that uses the code under any other form of licence. The creativity embedded in the code cannot be privatised. Kloppenburg and a group of like-minded seed companies, plant breeders and academics want to apply similar licences to plant genetic resources. Kloppenburg is at pains to point out that actually he has nothing against plant patents, other intellectual property rights, contractual “bag-tags” or any of the other mechanisms that commercial breeders use to enforce ownership of their products. There have been three meetings so far to discuss the Open Source Seed Initiative, and although the details have yet to be worked out the underlying concept is simple. An OSSI licence allows me to give you seed (or any other form of plant genetic resources) with only one condition: that you have to share it, and anything you create with it, with exactly the same condition attached. “It becomes viral,” Kloppenburg explained. “Now ‘viral’ is kind of problematical for people in agriculture,” he conceded, “but it is. It propagates.” As it does so, it creates a protected commons, as opposed to an open commons, of things that can be freely shared but not privatised. That is OSSI’s great potential strength, according to Kloppenburg. The general idea of a protected commons for plant genetic resources bubbles up from time to time, Kloppenburg told the audience, citing Richard Jefferson’s CAMBIA initiative as one manifestation. He credits the germ of OSSI to Tom Michaels, a bean breeder then at the University of Guelph in Canada, who in 1999 proposed the idea of a general public licence for plant germplasm, or GPLPG. Kloppenburg stressed that the lack of a monopoly does not mean a lack of payments. As with open source software, there are many ways in which plant breeders and others can seek payment for their services. There could be different forms of OSSI licence, allowing royalty payments to the breeder on the first transfer. And seed companies would be free to charge for OSSI-protected varieties. Many details remain to be worked out. Who will police the licences, and how? Will it be possible to discover traits shared under OSSI and then incorporated into privatised varieties? How could that be proved? And the global plant genetic resources community has yet to start a serious discussion of the idea. That may prove a hard sell after the long struggle to obtain the current International Treaty on Plant Genetic Resources for Food and Agriculture, which Kloppenburg doesn’t think is working. The really radical route to establishing a just and agronomically productive regime for managing flows of crop germplasm is not to arrange payment for access to genetic resources, but to create a mechanism for germplasm exchange that allows sharing among those who will reciprocally share, but excludes those who will not. The current material transfer agreement that accompanies plant germplasm under the International Treaty has some elements of an open source licence about it – but could go much further. Is there any chance CGIAR genebanks, whose holdings constitute the bulk of germplasm available under the International Treaty, could actually lead the way to the just and productive regime that OSSI is looking for, or are they too beholden to the private sector? There are also numerous domain names registered with names like open source seeds and so on, by people who have tried to start such an initiative. On August 1st, in a few days, I’ll also be giving a talk called ‘Open Source Food’ at the OHM2013 conference in the Netherlands, where I’ll be talking about many of the barriers to this, and the SMTA is top on my list. The EU seed marketing laws are a close second. Changing the IPR on seeds and food to make it closer to software would solve a lot of problems, and allow a lot more innovation. It’s not that I’m criticizing Jack’s idea, but he’s far from the first person to bring it up. There are easily dozens of people working on various initiatives along these lines, all over the world. Thanks, that’s obviously another book I should add to my reading list. Lots of good thinking there but also a puzzle. Kloppenburg was one of the pioneers in documenting the value of crop introduction (another was Purseglove, who actually worked out why introduced crops do `better’). Why not hammer home the `open source’ advantages to all of crop introduction? Not just in production, but in global trade. For example, if China gets no direct financial returns for its soyabean germplasm used in the Americas, it gets lots of benefits from massive production and competition (and consequently a lower price for exports) between North and South America for the market in Asia. And some of us grew up with (almost) open source, with the USDA collections and the CGIAR collections the basis for lots of plant breeding for developing countries. This changed after `biopiracy’ came along – based on zero understanding of the ecology of plant introduction – and the subsequent political morasses of the CBD and the ITPGRFA. If anyone has read the papers for the 5th Governing Body meeting of the Treaty it will be evident that the Treaty has to change. Kloppenburg’s ideas – crop introduction and open source – could be a basis for us to get out of the present mess. I have an acerbic comment in `Nature’ (correspondence) 25th July issue on the Treaty: as with Kloppenburg, I think it isn’t working. The treaty isn’t working because “genetic resource” and “germplasm” are abstract terms and non-tangible. Whole genome DNA sequences have to move centre stage in this debate and then shared ancestry, haplotypes, and alleles will be the units of access and benefit and will become what CO2 is for the climate change debate. Norman: The abstraction problem is why I call the ITPGRFA the `FAO Seed Treaty’: you can collect and touch and smell seed. If we can’t get developing countries to share seed internationally – apparent now with the FAO Seed Treaty – the whole lot will seize up, no matter what the `unit of access’, and there then will be no benefit-sharing. Or we can forget the Seed Treaty and use your `centre stage’ technologies to comb through what we have in accessible seed stores – the USDA, CGIAR, and samples stored in developed countries for example. These are exactly the samples the CBD refused to legislate on. This could keep us going for 20 – 30 years. Unless the Seed Treaty sort out its act in the next few months, that is going to happen. 1) The Open Source Seed Initiative prevents the privatisation of plant genetic resources. 2) There could be different forms of OSSI licence, allowing royalty payments to the breeder on the first transfer. If #2 is true, than #1 is false, as by allowing royalties you are indeed privatizing. My understanding is that by using a “private” open source license you are attempting to create greater public access to a resource. The plant genetic world lost a helluva lawyer when he went way too young. Thanks for the recommendations Matt. I’ll certainly check out that book. I’m not sure I understand the contradiction you identify. If I am the breed, and I give you foundation seed of my variety with an OSSI licence, that licence may specify that you have to pay me a royalty when you sell seed to someone else, but nobody else who passes seed on needs to pay me (or you) a licence. How is that privatising the seed? There’s nothing to stop people charging for seed in OSSI, as far as I can tell. My point on privatizing was poorly articulated. Maybe “contradiction” was the wrong term. Open source licences are private licenses, the creator (breeder) has private control over what can and cannot be done with subsequent generations. This could include a royalty return, acknowledgement (you have to name them in your catalog, for example), and even sending examples of derived materials back to the creator. They are private licenses, held by a private party, and protected by private property law….but you wrote “OSSI prevents the privatisation of plant genetic resources”…what it actually does is ensures public access to plant genetic resources via private contracts. Open source licences are private licenses, the creator (breeder) has private control over what can and cannot be done with subsequent generations (with limitations – that is they have to include allowances for derivative works, sharing, etc – depending on which type of license – OSSI is working on 4 licenses, from what I have heard). This could include a royalty return, acknowledgement (you have to name them in your catalog, for example), and even sending examples of derived materials back to the creator. They are private licenses, held by a private party, and protected by private property law….but you wrote “OSSI prevents the privatisation of plant genetic resources”…what it actually does is ensures public access to plant genetic resources via private contracts. I’m really not sure what we’re arguing about here Matt, especially in the absence of actual OSSI licences to examine. The book you refer to — I can find a paper of that name, ironically locked up. If you have a copy to share, I would appreciate one. Cardoza Law school published it as a small book. May not be available any longer. I may have an electronic version on an old drive, will look when I get back from the next 3 weeks of travel. Ditto, Jeremy: I can’t find it either. But I did find the “Free Seeds, Not Free Beer” from the Fordham Law Review 77 and didn’t like what I read. For example: “… the ITPGR currently categorizes the sixty-four crops and forages listed in Annex I to the treaty as belonging to a type of “limited commons.” Therefore, PGRs for those crops coming from CGIAR seed banks may not be (intellectual) propertized “in the form received.” However, by implication, all PGRs not included in the ITPGR Annex are considered “sovereign property” of the nations wherein they exist, and TRIPS mandates that such nations must provide plant variety protection or equivalent sui generis intellectual property protection.” This is confused and the `by implication’ bit is not so. Annex 1 designation has little to do with considerations of national sovereignty. All crops `wherein they exist’ are sovereign property. The de facto importance right now is whether samples are outside the country of origin and therefore not covered by the CBD. Annex 1 and non-Annex 1 crops in the (developing) country of origin are not generally available under the ITPGRFA. In contrast Annex 1 and non-Annex 1 samples in the CGIAR genebanks are 100% available. Figures from the IT/GB-5/13/5 report to the 5th Treaty GB meeting in eight weeks time are shocking. For example (the worst one) rice. Global holding for Treaty parties are 38.54% of global total. Of this percentage only 2.46% are available. Holding of CGIAR (type – CATIE also included) institutions 16.70% of global total, but this is 100.00% available. The key fact is that samples within the country of origin, despite Treaty membership, are not generally available: outside country of origin samples (CGIAR plus developed countries) are far more available. `Open Source’ is baying at the moon in the light of these figures (and the Treaty is broke – no money). My constant advice in the decade before the Treaty was `If it ain’t broke, don’t fix it’ – with respect to the `old’ CGIAR-USDA distribution of germplasm. I was ignored when they went after the money – but there is no money. I wrote a chapter In Jack Kloppenburg’s 1988 book `Seeds and Sovereignty’ on `Crop germplasm: common heritage or farmers’ heritage?’ (and got a published pat-on-the-back from Jack Harlan). This was after I got into crop introduction – I took over Purseglove’s office in Trinidad and his aura must have rubbed off. Aoki is way off track when he goes on about colonialism: “Even after former colonies gained independence, the patterns of germplasm flow ran from the former colonies into the laboratories, genebanks, and testing fields of the developed countries.” Rubbish. It ran oil palm from West Africa and rubber from Brazil to Malaya, tea from Asia to Kenya and hundreds more beneficial trans-tropical flows (and lots of forestry examples too, but foresters are more sensible about this than crop people). This discussion has a confusing combination of software and plant breeding concepts. In the computer programming world ‘Open Source’ refers to the computer code being made public, because with this, even if it’s protected with some sort of IPR, it can easily be rewritten in another way by someone else, who denies all knowledge of the original. The Windows operating system is closed source, as well as protected by IPR, for just this reason. In the plant breeding world, this might be compared to a plant breeder keeping the maternal varieties behind an F1 hybrid secret, or even the varieties used to create an OP variety. For example, Tom Wagner closely guards the identities of the varieties he used to create his Green Zebra tomato. The concept of Open Source and Closed Source plant breeding is a little less important in the plant breeding world, because at least for OP varieties you always need to go through the process of selection, and can’t always reproduce a variety exactly even if you know the maternal lines. In addition, unlike software, you can still do a lot with any given variety or trait, even if you don’t know anything about the pedigree. In the case of software, if you have the source code, you can generally copy it exactly without much effort, which is why the term ‘Open Source’ and ‘Free Software’ are usually synonymous. The reason why Free Software is often compared with free beer, is because if someone gives you a free beer, all you can do is drink it and pee it out. There’s nothing else to do with a free beer. The concept with Free Software however is different. In this case ‘free’ means you can do a lot more with it other than just use it and throw it away. The ITPGRFA and associated SMTA offer genetic resources that are free as in beer. Free Software always comes with the source code, so you can change it according to your needs. You are also very welcome to sell Free Software, if you can find someone who wants to pay for it. It’s not uncommon for example for a computer consulting firm to put their own logo on a piece of Free Software, and sell it together with consulting services to a client. Ubuntu is an example of a company that sells Free Software. The only condition is that any derivative works need to also be Free Software, and no one can place any future restrictions on it’s use. A company like Microsoft or any other software company can however always look at the source code and rewrite it according to their needs, and deny their new software had anything to do with the original Free Software. In this sense, the main issue here is computer software is not a finite resource, like plant genetics. Computer software is all based on creativity. The issue I think Matthew was trying to get at is that if OSSI ‘prevents the privatisation of plant genetic resources’, it would be a contradiction in terms, at least when compared to the Free Software world. You can’t prevent anything with Free Software, by definition! If we are to have some equivalent between the worlds of Open Source Software and Open Source Seeds, you have to start by ending all restrictions on the genetic resources themselves, and instead put IPR on the creativity of the breeding work and maybe the methods used.